Choose our fully customized silicone wristband when you want additional options and a great price. 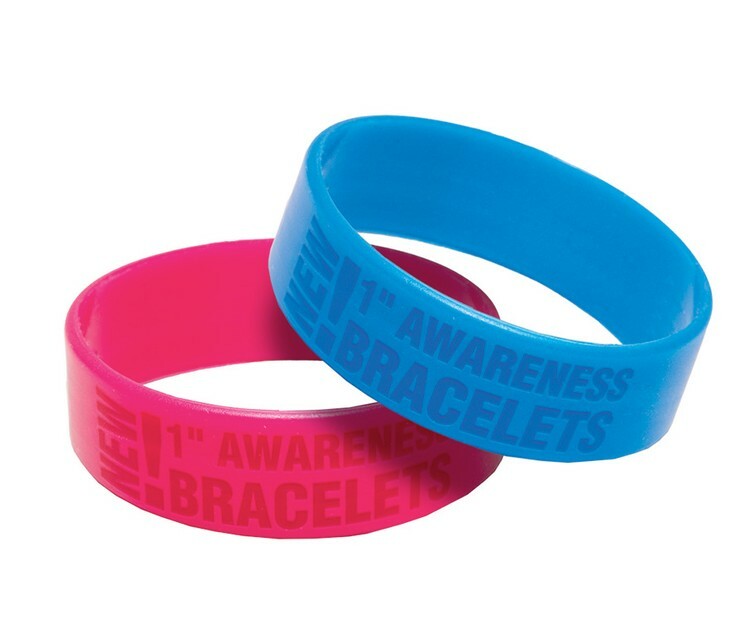 These fully customizable silicone wristbands are a smart way to promote your message, cause, occasion, event, team, or company! If you want color, choose our color fill option and we can combine debossed and screen printing for a unique look. The material is 100% silicone which ensures that they will not break or tear easily and can be worn for months. You can choose any PMS color for the silicone and have any PMS color printed or color filled. For our quickest turnaround Priority Service, we like 2 weeks to produce and deliver your custom bracelet, if you need them faster, please ask us for our fastest available production time. If you select Priority Service, the FREIGHT IS FREE to 1 US location. We will do our best to accommodate any request. Decoration method: Debossing or Embossing Included in unit price- Exterior - Front and Back; screen printing additional cost for the interior of bracelet. - Exterior of Bracelet (Adult) 7.5" x 0.80"; (Medium) 7" x 0.80" and Small 6.5" x 0..80"
$88.00 (V) for extra mold(change of design or size). to 5,000 units (within 3.5 x 3/8" for adult size); for 5,000 units + call for pricing. SPECIAL FEATURES: Glow in the Dark (NOT UV Reactive; see our product UVBD-01 for pricing), Glitter pieces, Segmented (multiple colors separated vertically; not a clean edge between colors) per color and Swirl Color (mixed throughout)per color $0.025 (R). We can not screen print or deboss on layered bracelet (horizontal layers on top of one another) $0.025 (R) per color.